Today I've viewing the world in a haze. Not by choice or by my own doing. About once a year I get a headache to end all headaches. I've never pinpointed when or why....it just happens. I get a headache and it winds itself up into a day of dizzy, stomach hurting headache mess. Lucky me yesterday was that day. I woke up early and started in on my days plans. Yes, my head hurt but I thought the advil would knock that right out of my system. I made breakfast pizza but was already feeling sick to my stomach by the time it was done. Thus, I decided to forego that and I jumped right into grocery shopping. By the time I got home at 9:30-10 I was in misery. I put the bare minimum of the groceries away (leaving non perishables sitting on the table...only putting away perishable items) I ate a slice of butter bread, because I knew that I hadn't eaten and knew that the growing stomach ache COULD be somewhat caused by that. I then decided to lay down for a few minutes to try to knock the headache out of my system. I woke up about 4 hours later. I answered a text or two, grabbed a blanket and slept some more. Yeah, I pretty much slept until 4 or 5 in the afternoon. My head was still pounding so I pretty much laid on the couch until Todd came home at about 7PM. The headache had eased a bit by that time and since there was no way I was in any shape to cook dinner we made our way to town to grab a bite to eat. Today my head doesn't pound. It's still a slight ache. I'm up and moving. But I feel like everything is in a haze. 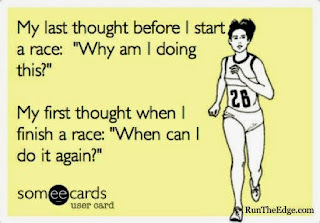 I was torn because I really wanted to go for my run today.....to try to maintain that consistency that I talked about the other day. However, I'm just not up to par. I'm afraid that a run will kick that headache back into high gear. I'm also just feeling week and slightly off balance (could be from all the laying around yesterday...in which case a run could wipe that from me). So I am going to pass on the run today. My plan? 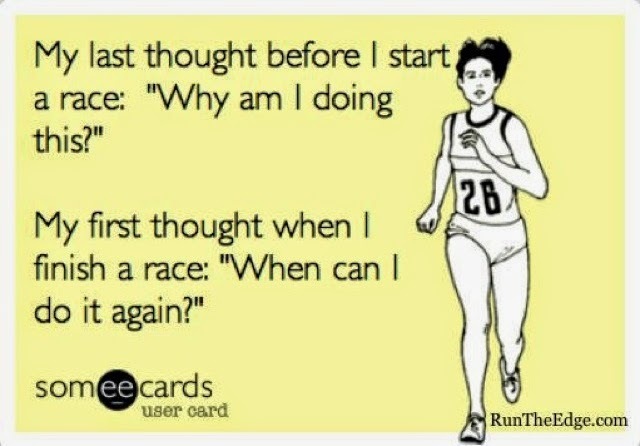 Run tomorrow....yes it will make it a double workout day for me. But them's the breaks! And then I run again on Tuesday, my scheduled run today. (which will clear Wednesday out for my normal zumba step class...or for whatever activity Todd and I do on our day off). This is about being healthy, and running while I'm clearly recovering from something (would it be classified as a migraine....who knows and I don't really care, I just know how miserable it made me feel) is not the way to be healthy. Probably not helping my headache was/is the emotions that are pouring through my body. I have been reading through my old journals. Yes, while my blog may be 8.5 years old. It really is just a weight loss blog. I do write about personal stuff on occasion. But I have kept personal journal since I was 14 (I had forays into diaries when I was younger than fourteen but never for long and who knows where they went...although wouldn't they be fantastic to read now??) 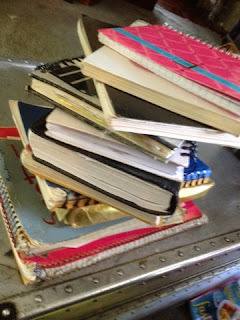 These journals are where I pour out my heart....my deepest pain and my most heartfelt cries. Writing is cathartic for me...so yes, they are still written out in long hand...pen and paper baby. When things are going good...I tend to write less. When I'm upset, I tend to write more. So I do know that reading them is not a totally accurate view of life because the good entries tend to be short and just snippets while the 'woe is me' entries tend to be pages of me working through my emotions. So I have almost 30 years of journals to read through. And read through them I am doing. I chose to read through them because I think I've lost me. Who am I? Where did that young idealistic girl go? Where did that young girl with dreams go? How did I get to where I am....pretty much unhappy with most aspects of my life. I guess my thought was that maybe if I reread these journals (which are for the most part fun anyway.....it's fun reading about getting your first car.....college pranks.....first dates....etc) I could rediscover that girl or maybe figure out where I got off the right path. So I'm maybe 10 years into my journal life. (hmmm....maybe I should sync up when i get to my online journal....watch the dates and read them simultaneously). I need to figure out how to be happy...how not to mourn the loss of dreams that I've had to let go. How to accept the death of dreams that are not meant to be. How to accept my life for what it is....and not what I want. Meanwhile, I am registered for the Krumpes Donut Alley Rally...August 8th....here I come.